I began my 18 years with the Gilbert District in the fall of 1979. My predecessor was Chuck Watts who taught for 11 years in Gilbert. Watts was a percussionist who also worked with the Arizona Wranglers, a drum corps in the area. When I came to Gilbert Marty Gierke was band director at the 3 elementary schools - Gilbert, Greenfield & Patterson - and I was band director for Gilbert Jr & Sr High Schools. Jack Radovich was the strings teacher for the district. Since there were so few high school strings students, they walked "down" to the junior high to combine with them for their class. 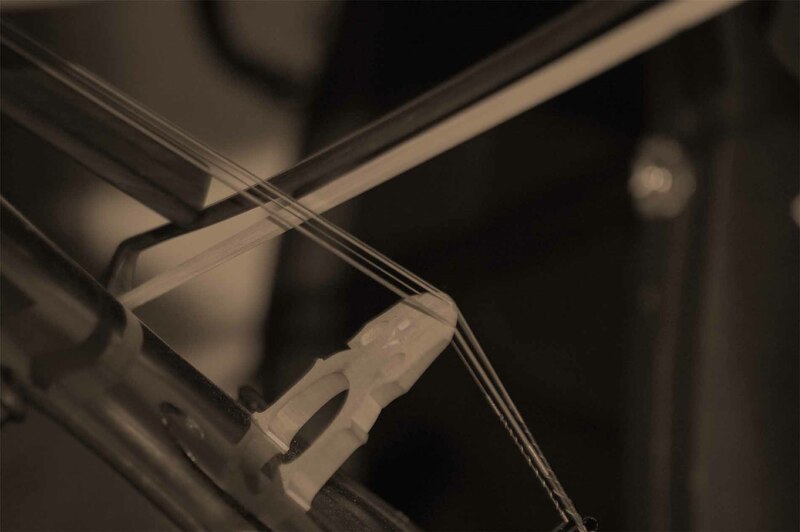 With Bill Bitter's first year we convinced the administration to allow the high school strings class to meet on the high school campus so the strings program would grow. Bitter's first strings class had a total of 5 students - as I recall two of those were barely past beginner level. The second year Bitter had about 12 students, the third year about 20 and the rest - as they say - is history. GHS/GJHS choir teacher was Hoyt Davis. My first annual salary in Gilbert with a full contract including addendums was a little over $15,000. I thought I was being very well paid, since my first year's full time salary from 8 years earlier in Tennessee was $6,000! Prior to my coming to Gilbert I was graduate assistant for one year with the ASU bands as I worked on my Masters. Prior to that I taught for 7 years in my home state of Tennessee. When I arrived at GHS the auditorium was near completion. My first concert at GHS was the premier concert in the new auditorium, Previously GHS band concerts had been held in the cafeteria. The band and strings shared the same rehearsal room and the choir and dance classes shared a room for a few years until the choir room was completed on the south side of the auditorium. Jasper Cowart was the superintendent when I began in Gilbert. The only directive he gave me was that the high school band was to always march in the Gilbert Days Parade. Apparently the previous year the high school band had gone to U of A's band day instead of the local parade. I always honored Mr. Cowart's directive and the year we marched both the Fiesta and Rose Bowl Parades we marched the Gilbert Days Parade twice! We had busses take us back to the beginning of the parade and marched through again! Richard Riley (later Dr. Riley) was GHS principal and Hank Luedy was GJHS principal. In my interview with Riley before being hired I asked what kind of a band program he wanted. He stated that Gilbert had developed a reputation as a good FFA and sports school and that he wanted Gilbert to also be known as a strong music school. I found out many years later that Mr. Riley took a lot of heat from parents because of me and that he told them to give me 3 years and see how things were. After 3 years, apparently we were getting along a lot better! Prior to my arrival at GHS the band had never had any rehearsals outside the school day, had a band camp or traveled out of state! There were 120 students on the band roll when I arrived. By ASU band day that number was down to 100 and at ASU's band day only 90 students showed up! The other ten were hunting, shopping, etc. My first year the high school included grades 9 - 12. In my 2nd year the new junior high opened and the 9th grade was moved to the junior high which had grades 7 - 9. As a result of this change with the 9th graders, the high school band had no incoming new students. We went from a 3 bus band my first year to a one bus band my second year. By using our "Great White" (school bus configured to carry instruments and uniforms) we could get our total marching band of 60 students on one bus. 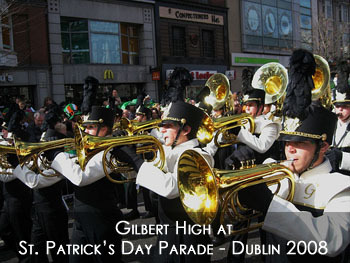 My 2nd & 3rd years at Gilbert our marching band had a total each year of only 26 winds! One year we had as many guard members as we did winds! My first year at GHS was also the first year for the State Marching Festival. 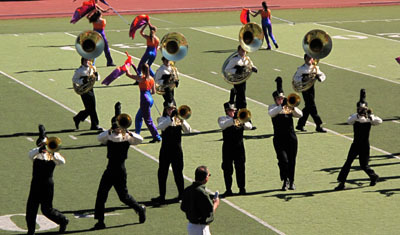 That year bands had to qualify with a superior rating at one of the university band days. (ABODA marching festivals did not materialize until several years later.) The first state marching festival was only about 24 bands total. We did not qualify for state that first year. However, following GHS band received a superior rating for 16 of the 18 years I was at Gilbert. (The only other year we did not receive a superior rating was the first year the state marching festival went to caption judging system - in the late 80's as I recall.) At the time I left, GHS had received more superior ratings from the state marching festival than any other school in the state and I believe that continues to be the case even today. During my first few years at GHS we had a homecoming parade each year. The parade went from the high school north about a mile through downtown. Since the parade was at the end of the day we could not get busses so we had to march the parade from the high school and then walk back to the high school. Parade consisted of a police car, the band, the cheerleaders and a float from each grade level. We continued the homecoming parade experience at the new high school (which opened in fall of 86 - I think) by taking advantage of the uniqueness of the facility. We divided our band into 5 bands. Freshmen would be a "band" leaving from the band room and the other 4 "bands" would position themselves in one of the 4 hallways - 2 on first level and 2 on the second level. At the appropriate time I would blow my whistle from the center of the building. The "bands" would begin playing the fight song and "march" to the gym. As the "bands" passed classrooms students would follow behind to the gym for our homecoming pep rally. Since I have always loved a parade, this event was always a highlight of the first semester for me. Somehow the "bands" always managed to "get together" while playing the fight song and converging to the gym. To my knowledge no band students were ever hurt while making their way down the steps from the 2nd floor! When the new high school was opened the 9th grade was brought back to the high school. I decided to keep the freshmen band "separate" from the older students. First semester was our JV Marching Band (all freshmen). Our Varsity Marching Band was grades 10 - 12. The JV Marching Band would march for a few freshmen or jv football games at home and one varsity football game. The JV Marching Band would attend one judged event so they could experience the adjudicated performance. Nearly every year adjudicators would approach me and ask how to "rate" our JV band. I told them to "give us an 'Excellent' and it would be ok" and that's what they always did! One of my highest "highs" was the year we took the JV band to NAU Band Day along with the varsity band. In those days the band days scheduled bands in order based on size with smaller band going first. 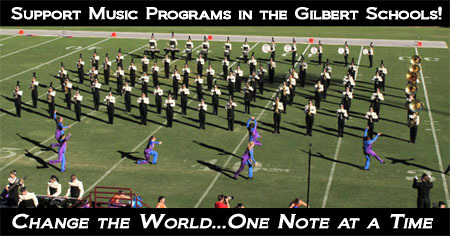 That afternoon at NAU our Gilbert bands were the last two bands! My high was the few minutes between our bands' performances when we had 120 JV band members beyond the south end zone as they had finished their performance and 235 Varsity band members beyond the north end zone awaiting their performance. The JV band situation was obviously a lot of work but the advantages were definitely worth it. Our Varsity band never had "rookie" members since our sophomores began the season ready to contribute. During second semester the freshman remained together in "Concert Band". In all the years of the JV Band we never had freshmen "cross over" into the "older" bands, even the 3 different freshmen who made the AZ All-State Band. During second semester older bandsmen were assigned to ensembles based on grade level and instrumentation. All seniors automatically were enrolled in our "Senior Wind Ensemble" with some advanced sophomores/juniors added as needed and as instrumentation would allow. Remaining sophomores/juniors were in our Symphonic Band which rehearsed the same period as the Senior Wind Ensemble. I believe this arrangement was instrumental in our having as many seniors as we did continue in band until they graduated. I do not know if it was true, but I was told one year by the MCC band staff that Gilbert had more second semester seniors in band that all the Mesa high school combined. During my first several years of teaching I did not believe that traveling with music ensembles was worth the expense. My frustration with the seeming mediocrity in the band programs in Arizona led us to travel to Southern California with our marching band for the first time around l985. The only opportunities to perform in AZ were football games and university band days utilizing the "judge everything" system. Small bands had to perform early for small audiences and what seemed to be a "different" standard of judging as adjudicators seemed to "save" ratings. 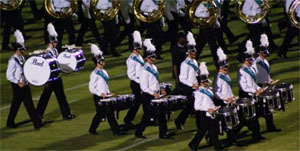 The Southern Cal system assigned bands to divisions based on their experience and "record" and utilized a caption system of adjudicating very similar to the drum corps system. Divisions were kept small so everyone "had a chance" to receive awards. We would usually leave on a Thursday and be able to schedule a clinic, an amusement park visit and two competitions before returning to Gilbert by "sun up" on Sunday. Our LDS community agreed to our out of state travel as long as their children were home by Sunday at "sun up". So we saved a night's lodging by driving overnight! We also traveled to Albuquerque once and Las Vegas 2 or 3 times. In June of '94 we participated in the Portland Rose Festival with our field show, parade and jazz bands. We also traveled with our concert ensembles a few times to Southern Cal and twice to Durango, Colorado. I believe that all of our GHS music ensembles improved as a direct result of our marching band traveling out of state. Improvements were evidenced by increased quality of program, higher visibility in our community and increases in financial support. Our out of state travel had a large impact on our being able to develop multiple staff members for our ensembles. Our band parents who traveled with us to Southern Cal marching competitions saw that the band staff did not resemble drum corps staffs. Our staff included myself, my wife as part time guard instructor and a part time drum instructor. Our parents reasoned that unless I got some help I would burn out for sure and, if we wanted to compete on a higher level, we needed additional staff. To assist in convincing Mr. Riley that we needed additional band staff, I invited him to attend a marching band rehearsal to have him witness the winds working in one area, the guard in another area and the percussion in another area. I appealed to his concern for student safety in rehearsals and during performances - with band students in the stands, at the concession area, at the restrooms, at the bus area - to justify need for additional staff as the band was beginning to grow. I also pointed out that when I had 80 students in band I was "doing the work" of two teachers. He agreed that for every 40 band students enrolled we would have a certified band instructor. Our assistant directors - eventually in choir and strings as well as band - were full time certified music educators who taught at other schools within the district. Prior to the opening of Highland, the GHS band staff grew to include 7 full time band instructors plus one full time percussion and two part time guard instructors. My addendum was equal to the head football coach's and our assistant band staff addenda were the same as assistant football coaches' addenda. This came about because of a committee commissioned to evaluate the addendum structure. It was reported to me that they came to their conclusions re: band staff addendum based on their observance of how hard the band staff worked, deducing that football and band addenda were equal. Before going "national" and affiliating themselves with Tostitos, the Fiesta Bowl was "local friendly" and encouraged Arizona bands to march in the Fiesta Bowl Parade. Most high school band directors weren't interested in having their bands participate but I observed that a lot of folks attended the parade and many of those folks had no other exposure to GHS music ensembles - so we marched annually in the parade. The GHS band uniforms were an out-dated style and a light gold - dare I say mustard - in color. We used those uniforms the first year but for our second year changed to a drum corps style uniform. We used the same uniform trousers and for a total of $1,000 contracted for a local seamstress to make black satin shirts, ascots and cumberbunds. One Tuesday in the spring after a Fiesta Bowl parade appearance, as I was leaving campus Mr. Riley stopped me to tell me that the school board wanted to buy uniforms for the marching band and choir and that he needed design plans and costs by that Friday! It seems that a school board member had been in attendance at the previous Fiesta Bowl Parade. While our homemade uniforms looked acceptable from a distance on the football field, when viewed "close up" in comparison to other band uniforms, ours were apparently a little embarrassing. I'm not sure if the school board was aware of what they were committing to, because for several years after that we annually purchased additional uniforms to keep up with our increases in enrollment. Our requests for additional uniforms were never denied. Soon after coming to Gilbert, we began the Band Boosters Club. Active parent involvement was crucial to the development of the band program. When the band was small parents were greatly needed simply because we had very little help. As the band grew in size, more and more things needed to be delegated and parents valiantly met the challenges year after year. The Band Booster club was most helpful in fund raising and assisting with our travel needs - within as well as out of state. Many booster parents attended rehearsals, learned how/when to set up equipment and became essential components of performances. It was my understanding that the band boosters were considered to be as influential as the athletic boosters in terms of helping to make decisions regarding using time, space and money within the district. Administrators - campus and district level - were willing to invest in music education to include taking "risks" in scheduling and giving programs time and space to develop, instead of always looking for "numbers" to drive all their decisions. Well-educated, stable and hard-working staff - Consider that during the Watts-Hatler-Edgar eras, Gilbert High School had only three "lead" band directors over a span of forty years! I once was told by one of our experienced staff members that Gilbert district music teachers worked harder than those in most other districts. Even though I was skeptical about the statement at the time it was made, I now agree with the observation. The vertical assignments (teaching at various levels - high school/junior high; junior high/elementary, etc.) influenced positively the strength of our programs. In addition, staff members shared a desire to use music to shape students into good citizens, rather than simply using students to make music. This philosophy guided many decisions including music selection (what do students need to learn), discipline decisions (what does this child need), and travel choices (with what destination do students need to become familiar). Placing learners first, even though not a stated understanding, was at the heart of the program. A leader/driver /face of the program aided in providing cohesion, direction, focus and visibility to music education. Parent Support - parents appreciated the unique and valuable opportunities available for their children through music education and were very willing to aid in their development. The results of the programmatic elements are seen in the number of students throughout the district who participate in performing arts, as well as in the academic achievements for which the Gilbert district is known. Not only did (and does) music participation contribute to learning, many students who would not otherwise have opportunities to excel experienced the benefits of achieving team success by being a part of the GHS Band. By developing habits of excellence, learning daily to collaborate and being a part of something that was greater than themselves, GHS band students "breathed in" the necessary characteristics of citizenship. Many, including myself, credit Phil Hatler (band) and Bill Bitter (orchestra) with the help of Rita Scholz (choir) as the primary source of the phenomenal music program we are so proud of today. I was a band and symphony orchestra student at Gilbert High in the early days of these two giants offering the most extreme of personal sacrifice to build a program of the highest passion, achievement, and ultimately national leadership. These men did more than build one of the finest music programs in the country, they became role models, mentors, leaders, and even father figures for literally thousands of young people who lead and serve the community today. Phil Hatler's history of music education in Gilbert is a fascinating study in how much grit and determination got us to where we are today. This shows how critical dedicated music educators are to our success. But in order for them to succeed, what strikes me more is the critical role of administration and parent support to both "invest" and "risk" in the program.